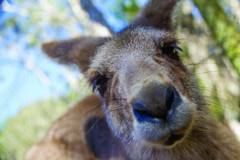 - 1 day admission to Currumbin Wildlife Sanctuary. Currumbin Wildlife Sanctuary is the Gold Coast's leading native wildlife and coastal rainforest experience. With hundreds of native Australian animals on display in natural surroundings, Currumbin provides a rare opportunity to get closer to amazing native wildlife. The Sanctuary is an Advanced Eco-Tourism Certified, National Trust of Queensland property which offers a world of discovery through fascinating wildlife shows and displays, with Aboriginal dancers also performing daily.